You dream of saying ‘I do’ in an intimate, serene ceremony before the most beautiful backdrop. Just as important: you want to avoid stress before and during your big day. A tropical setting and constant pampering will dissipate all anxiety, making Cancun the ideal wedding destination. If you’re like most destination brides or grooms, you’re primarily interested in booking a scenic venue. 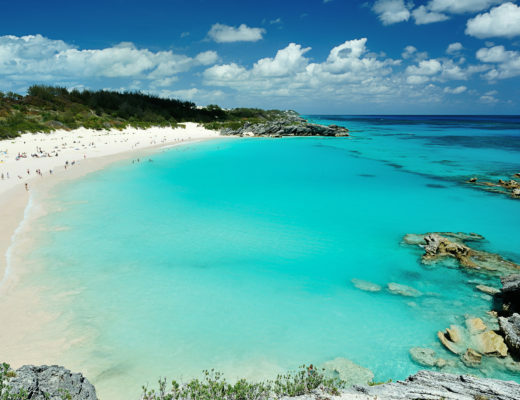 On the most romantic day of your life, you want to gaze out over crystal clear waters and soft white sand. Years later, you’ll smile while browsing through photos of your picturesque wedding. Cancun makes this possible by providing a breathtaking backdrop. When you book a resort wedding, you can take advantage of a variety of gorgeous Cancun wedding venues. Many prefer to wed barefoot on the beach. Others opt for picturesque gazebos, often featuring decor that matches couple’s unique preferences. Lush garden nuptials amp up the elegance, as do ballroom weddings designed for larger parties. Some resorts feature romantic beachfront terraces or traditional chapels. No matter your preferred venue, you can count on Cancun for an attractive setting for your big day. Nothing offsets an outdoor ceremony quite like an unexpected cold front or torrential downpour. 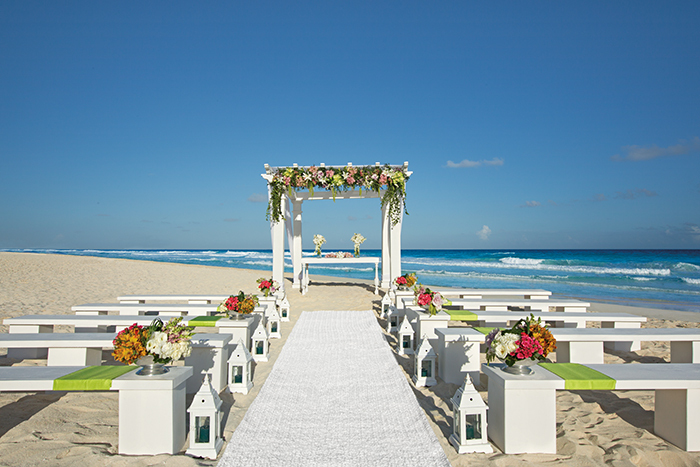 In Cancun, there’s no fear of bad weather mingling with your big day. Temperatures hover between 70 and 85 degrees Fahrenheit throughout the year. While sporadic rainfall hits the Cancun area, it’s easy to plan your wedding during the least rainy season. Ideally, if you’re looking to avoid rain showers, you’ll book your Cancun beach wedding for February or March. This is also the perfect time to escape cold weather back home. Rainy season occurs in fall, but provides an excellent opportunity for a discounted wedding. Either way, you’ll love Cancun’s climate. What’s the point of planning a picture-perfect wedding if you spend the entire week prior worrying about the details? By getting married in Cancun, you can hand over the more stressful aspects of wedding planning to your resort-based wedding coordinator. Booking a Cancun wedding package allows you to craft the exact experience you desire without fretting over logistics. Instead, you can relax and enjoy the final days of your engagement with family and friends. Best of all: several Cancun resorts provide pre-wedding spa services to pamper the bride and groom, and their respective parties. It’s no secret why so many couples opt for Cancun honeymoons — exciting and romantic activities abound. Whether your idea of a good time involves lounging on the beach or participating in heart-racing watersports, you’ll have a blast. A wide range of Cancun attractions will also keep wedding guests entertained. Fashion lovers adore Cancun’s shopping districts and malls. 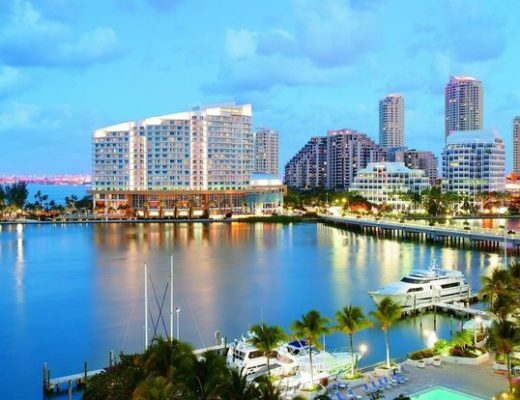 Invest in unique styles at La Isla, which is home not only to the region’s best fashion stores, but also a large aquarium. Prestigious brands are in abundant supply at the beloved Marina Town Center. After you find your favorite new outfit at Cancun’s shopping malls, hit the green for an exciting afternoon at a championship golf course. Favorites include the El Tinto Golf Course and the Riviera Cancun Golf Club. Looking for new thrills? Combine the excitement of an amusement park with cultural immersion at Xcaret. The eco-archaeological park will excite you with cave walks, raft exploration, and a unique tour of a Mexican cemetery. Broaden your horizons by booking a Cancun day trip. A variety of exciting Cancun excursions are available, especially for those with passion for the great outdoors or ancient history. Isla Cozumel is a top option; accessible by half-hour ferry, this gorgeous destination offers plenty of cultural charm. Don’t forget to visit Isla Mujeres, home of the beautiful Garrafon Natural Reef Park. The island’s Dolphin Discovery attraction allows you and your sweetheart to make friends with dolphins. Cenote adventures are just as compelling as island excursions; Casa Cenote offers an unforgettable snorkeling experience. Some resort towns focus almost exclusively on nightlife and cosmopolitan attractions, while others emphasize serenity on the beach. In Cancun, you can enjoy both. Most Cancun resorts boast multiple bars, lounges, and nightclubs, but are also located within easy access of local nightlife hot spots. Planning an unforgettable bachelorette party? Prepare for bass-heavy music, shots of tequila, and sensuous dancing at Cancun’s superclubs. Cancun partying is a blast, but sometimes, you need a little peace and quiet. Private stretches of beach in the Cancun Hotel Zone allow for blissful days of sunbathing, complete with drink service. Some resorts even offer romantic sunset dinners on the beach. 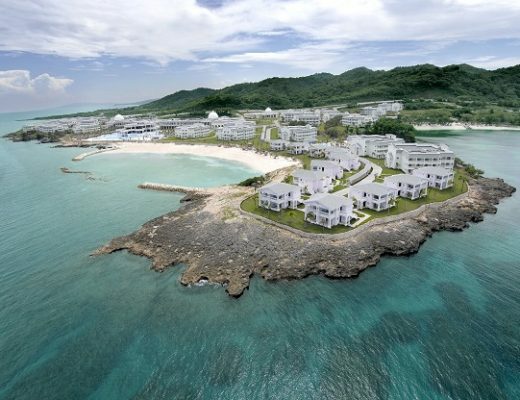 Playa Delfines (or Dolphin Beach) is true paradise, especially for newly-married couples. You deserve romance and beauty on the most important day of your life. You also deserve full pampering. You’ll never regret booking your wedding within the Cancun Hotel Zone.